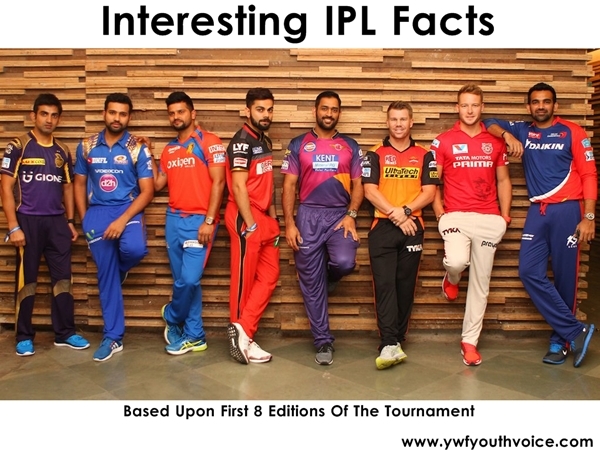 Look at some interesting facts based upon first eight editions of the IPL. 1. Opening Games of IPL always featured Mumbai Indians or Kolkata Knight Riders or both. 2. Suresh Raina has never missed a Match for his Franchise in IPL. 3. Mahendra Singh Dhoni is the only player to Captain his team in all the editions of the tournament. 4. Sachin Tendulkar was the first Indian player to win Orange cap, later Robin Uthappa won it in 2014. 5. Out of 13 teams which took part in IPL, 5 different teams have managed to win the Trophy at least once. (i) Rajasthan Royals has won the inaugural edition in 2008. (ii) Deccan Chargers Hyderabad won the tournament in 2009 which was held in South Africa. (iii) Chennai Super Kings has won on two different occasions 2010 & 2011. (iv) Mumbai Indians also won the tournament two times in 2013 & 2015. (v) Kolkata Knight Riders has also won the IPL trophy in two editions in 2012 & 2014. 6. Chris Gayle remained UNSOLD in 2011’s IPL Player Auction. Later he was taken by RCB as a replacement to injured Dirk Nannes. 7. Gayle is the only Player to win 2 Orange Caps in IPL. After replacing Dirk Nannes in RCB, Gayle won the Orange cap for two successive years in 2011 & 2012. 8. Chennai Super Kings: Only team to reach the Playoffs in all previous 8 editions. 9. Gayle & Michael Hussey hold the record for most number of runs in a single edition – 733 Runs. 10. CSK have been a part of 6 Finals, most by any Team in IPL. 11. Rohit Sharma & Yusuf Pathan have lifted the IPL Trophy 3 times, most by any player. Yusuf Pathan: 2008 for RR, 2012 for KKR, 2014 for KKR. Rohit Sharma: 2009 for DC, 2013 for MI, 2015 for MI. 12. Parthiv Patel has played for 6 different Teams in 8 years of IPL, most by any player. 13. Of all the Teams who have 4 or more years experience in IPL, Delhi Daredevils is the only Team to NOT reach the IPL Final at least once. 14. Gautam Gambhir holds the record for most number of 50’s and most number of ducks. 16. Chris Gayle has scored 5 Centuries in IPL, most by any player. 17. Raina leads the list for most runs scored (3699) and Gayle occupied the Top spot for highest Individual Score (175). 18. Lasith Malinga has taken most number of wickets (143) and Sunil Naraine has the best Economy rate (6.00). 19. Amit Mishra has 3 hat tricks in IPL, most by any player in IPL. 20. Sarfaraz Khan is the Youngest player (17) & Brad Hogg is the Oldest player (44) to play in IPL. For more interesting IPL updates you can follow us on twitter and facebook.